At the recent Salesforce Dreamforce conference, Salesforce announced Einstein Plus, a visually improved no-code version of their artificial intelligence platform. 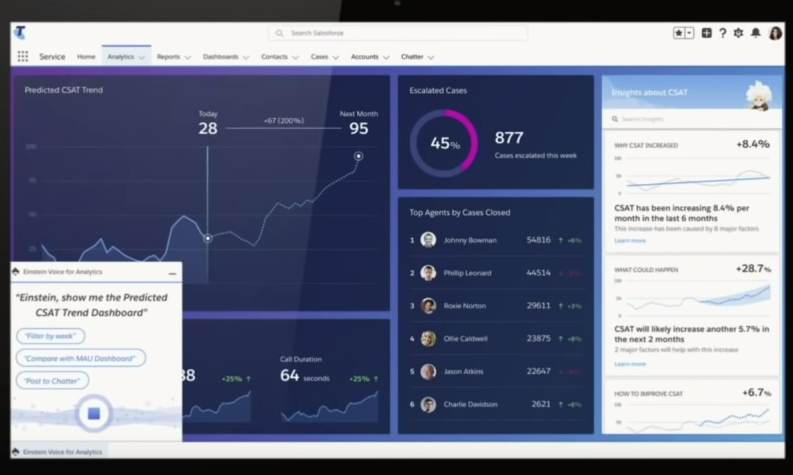 Prior to announcing this new product release, Ketan Karhanis, SVP & GM of Salesforce Analytics discussed why AI insights are potentially transformative to businesses who have the guts to trust them. We must be clear about one thing, technology is simply an enabler. Real transformation requires trailblazers. We live in a time of tremendous technological change with lots of good stuff happening AI, AR, voice. This is not about the technology, it’s simply about you. The single biggest question is how does all this enable your success and what does this mean to you? You all know the world of business applications, such as sales, service, marketing, you know this world very well. Then there’s the world of analytics, some call it visualizations and some call it reporting,. No matter what you call it it is important because it’s crucial to see what is happening in your business and why. Now we have AI, the game-changing power of AI insight. What does that mean? Now we can get a glimpse of the future. We get predictive and prescriptive, very exciting technology. But are you going to be swivel chairing three different boxes, three different logins, different stats for everything, one stack for ML, one stack for visualization? That’s probably not going to be fun because here’s one simple thing we need to realize, these are not three separate boxes they are facets of the same experience. AI and analytics need to come together and they need to be infused in your business applications. What you need is not just a digital experience but an intelligent experience where analytics is built right in and if done right analytics becomes invisible but you get the benefits of it, and the benefits are pretty spectacular. We are drowning in data, lots of data everywhere. Making sense out of millions of data points in sub-second speeds to derive insights, that’s kind of hard, our brains are not really wired to do that. You need automated discovery. Automated discovery helps you discover the story in your data and the intelligent experience comes built with automated discovery. Insights have to be outcome focused. Of course, you need charts which tell you about the past, but you need recommendations and explanations. You probably don’t need yet another dashboard which tells you what happened. You need better outcomes for the future and you should not settle for incomplete. From visualizations to predictive to prescriptive you need it complete in one experience. You need smart analytics. AI stands for actionable insights because an insight which does not lead to an action is just a dumb chart. That’s why connecting to the business process is key. Insights need to drive better actions. You need to be able to leverage your existing teams and bring them to this new world of no-code AI, of a completely different way of interfacing with your insights. AI’s role is amplifying your effectiveness, it’s about augmenting your skills but how will you trust it. That’s why accountability is key, transparency is key, and you need all of this.